Before we moved to Dushanbe I didn’t do a lot of reading about what it meant to be a foreign service trailing spouse. I was preoccupied with a lot of other things such as leaving my job, moving to a foreign country, starting a new job at the Embassy, figuring out what the heck I was doing for consumables, and the logistics of moving a dog and two cats halfway around the world. This go round, I won’t pretend to be an expert, but I at least have one move as a baseline to learn from and improve upon. I’m also curious what reading material exists to better prepare myself for the move from more seasoned veterans of expat life. This lead me to Unpack: A Guide to Life as an Expat Spouse. And I have a lot of thoughts. Let me first start by saying I’m one of those annoying people who needs to figure things out for herself, and sometimes has to do things the hard way for awhile (case and point, when I refused to get a dishwasher for six months in Dushanbe). I seek advice when I feel like I need it, but as a rule, if you tell me I should do something, I won’t want to listen. Let me figure it out on my own. Knowing that about myself, I tried not to go into this book with bias, but oh man, it was hard. It assumes I’m a woman. Ok, you got me. 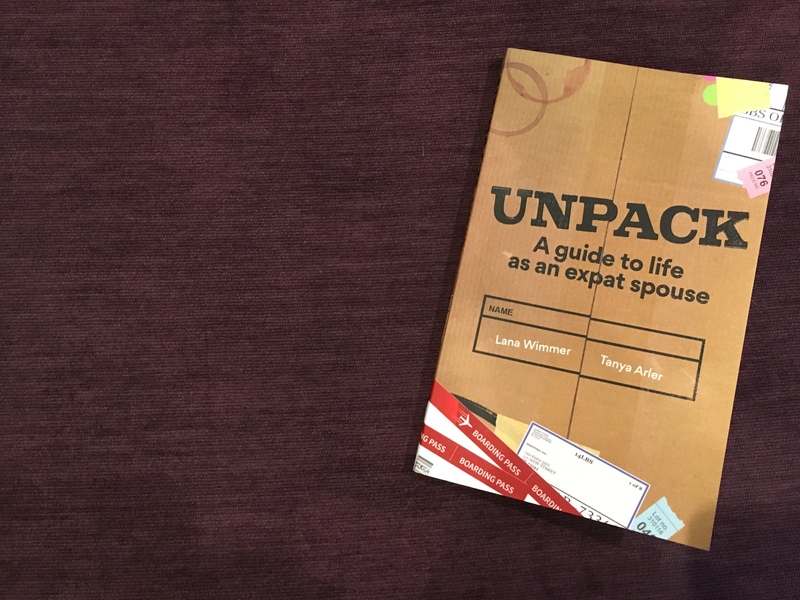 This book is called Unpack: A Guide to Life as an Expat Spouse, but a more accurate title could be Unpack: A Guide to Life as an Expat Wife. The second sentence begins with “Your husbands’s work is moving the whole family to a new country…” and it immediately rubs me the wrong way. I’ve met several trailing husbands and their sacrifices and experiences are completely discarded in this book. All of the testimonials are from women, and I would have liked to hear the men’s perspective as well. It assumes I have children. Nope. Just furry creatures. It would be a huge oversight to skip over advice about moving your children, helping them adjust, and navigating foreign school systems, but a simple addition “for those of you with children” would have helped. I do think a lot of the advice was helpful, and I’ll probably reference this in the future if we have kids, but there wasn’t much in here for someone without kids. It assumes everyone moves at the start of a new school year. As a former CLO Co-Coordinator, I can tell you people arrive all year long. Failure to acknowledge difficulties in transitioning after the heavy turnover seasons when everyone is already somewhat established does those off-season transfers a disservice. It assumes I’m moving to a first world country. My very first experience living overseas was Tajikistan. Not Western Europe or Southeast Asia. I’m not discounting the culture shock that can happen in the more developed world, but I have to believe living in London is much easier than Dushanbe. It assumes I don’t want to work. And in the two brief sections about working, it assumes you’ll be able to quickly and easily find a job. I can only speak for my own experience, but if I hadn’t been working in Dushanbe, I would have actually gone insane. I was lucky to land the job at the Embassy, and we were lucky to have a Bilateral Work Agreement with the Tajik government which meant spouses and family members of official Americans were allowed to seek employment on the local economy. This isn’t the case everywhere. There was a lot of good advice about finding fulfillment in volunteering, but it would have been nice to hear from spouses in less developed countries who get creative with their time if working isn’t an option. It assumes people in your life won’t pull back. We are lucky. Our friends and family not only do their best to understand what life in the Foreign Service is like for us, but they also make a point to see us when we manage to get Stateside. I’ve talked with many other officers and spouses who can’t say the same thing. Since we spend so much time detached from the lives of our friends and families, sometimes those closest to us pull away. Not necessarily intentionally, but as an act of self-preservation. It’s isolating. Another thing that annoys me about this book is it never mentions culture shock by name. They call it the “expat funk” which sounds akin to a bad day when really the issue is much larger. I’ve talked about culture shock on this blog before, and I’m quite outspoken about it. Everyone needs to know about culture shock before they go overseas, and no one should be ashamed to admit they are going through it and need help. It’s also important to be able to recognize culture shock within your family. It helped us tremendously. I think the authors had the best intentions while writing this book, and the genuine concern for you and your family’s well-being radiates. I wish a bit more care has been taken to avoid assumptions and generalizations, but helpful advice does exist if you are willing to sift through Unpack‘s pages.